Echo North?? DO YOU MEAN, ECHO “MORE” because I want more of this book? Subscribe if you want more high-quality puns. I put time and effort into them. For example, I spent at least 3 seconds thinking about that Echo More pun. This book is a retelling of Eros and Psyche, East of the Sun West of the Moon, and Tam Lin. It also had Beauty and the Beast & Cinderella vibes, if you’re not already convinced by the “Eros and Psyche” part. <span style=”font-size: 10pt;”> Also, some of the links provided are affiliate links meaning that if you purchased from them I would get a small sum of money. Like 2 cents, probably. I WANT THOSE TWO CENTS. 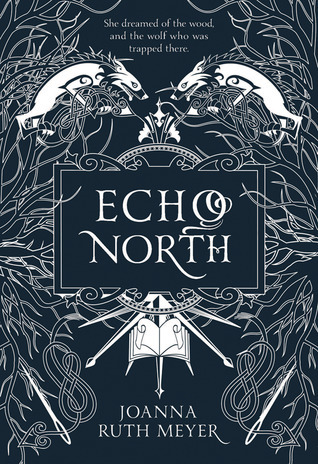 Echo North was one of my top seven books of 2019, which I listed in my “favorites of 2018” post. You should read it. This story follows a girl named Echo Alkaev who was attacked by a wolf when she was young, leaving her with scars on her face that disgust any villager that sees her. Her father is the only one who she truly connects with (and their relationship was so touching ahhh!) and isn’t taken aback by her face. When Echo’s father is injured in the forest, she’s presented with two choices: go with the wolf and stay with him for a year, or let her father die. And of course, she goes with the wolf and stays with him in this magical and mysterious house. And this house is absolutely amazing and I totally want to live there ahhhhh! It’s made up of different rooms, and each room is a surprise. There’s a garden, a room of spiders, a room of birds, and SPECIFICALLY a room made up of book-mirrors. Book-mirrors act as portals where you can enter and be surrounded by a world from a story. The “reader” can either stay with the story and view the plot, or they can simply meander and view the rest of the world that the “writer” built. The readers are treated as people in the story, and if readers go into the same story, they can meet each other! The catch is that the house is falling apart, and Echo’s duty is to collect special silk from the spiders and to “sew” each room together to keep them from falling. Echo’s also not allowed to look at the wolf during nighttime: if she does, she’ll be immediately banished. Anyways, this book… was so spectacular! It seems so very predictable, but there’s so much more to the plot that really turned around the story to me, and I just absolutely loved the worldbuilding in it. THIS WRITING THOUGH. I don’t know how Joanna Ruth Meyer just managed to pull me into this world, but she somehow REACHED ME AND JUST DRAGGED ME INTO THERE or something. This novel is separated into three parts, and I loved every one of them! The setting is overall in a Russian wintery landscape, and the mythology infused into it just felt so real to me!!! This was a buddy read with the lovely Mith from Sorcery of Mith! You read half the book and then I binged it. Trigger and content warnings for sickness, an animal attacking a human (specifically a wolf attacking someone’s face), and death. Thank you so much to Page Street Kids for sending an advance reader’s copy in exchange for an honest review! Have you read this? What did you think of it? Have you read Spinning Silver? Do you like wintery Russian landscapes as settings? Have you heard of Eros and Psyche? I wrote a review on this book not so long ago: I adored it too. Ivan rocked! YESSS I’M SO GLAD YOU LOVED IT AS WELL. Ivan :’) I love him!! Great review, your personality comes through so well in your posts I love it! This sounds??? SO good? I’m in big trouble because I’ve read like 15 book reviews/2019 TBRs today and my TBR is soooo much longer because of it — but screw it, I added this one too. Thanks for sharing your review! I’m excited to check this out! I’m SO excited for this book!! I did my thesis on Cupid and Psyche/East of the Sun, West of the Moon – I need this book now! OOH that’s amazing!! YOU’LL LOVE THIS BOOK— the East of the Sun, West of the Moon part doesn’t really kick in until the last 1/3 of the book!